Patients, parents and organizations on either side of the debate on expanding access to medical cannabis oil will be the first to testify for a legislative study committee Aug. 29 in Atlanta. The committee hearing will limit the subject to medical marijuana use and not consider the subject of marijuana for recreational use, said District 67 State Rep. Micah Gravley, R-Douglasville. Gravley, co-chairman of the Joint Study Commission on Low THC Medical Oil Access, Tuesday announced details of the first commission meeting set for Aug. 29 from 1 to 3:30 p.m. in room 341 of the State Capitol in Atlanta. “The primary purpose of this hearing is to allow testimony from patients, parents and organizations or associations in support or opposition of expanding the accessibility of medical cannabis oil,” Gravley said. “The committee will not entertain testimony regarding the legalization of recreational marijuana use, as we maintain the posture of the Georgia General Assembly which does not support expansion of the law to include recreational use,” he said. Gravley, whose district includes parts of Douglas and Paulding counties, and co-chairman District 28 State Sen. Matt Brass, R-Newnan, will lead the hearing. Those interested in testifying before the committee should contact Denese Sampson by emailing denese.sampson@senate.ga.gov. Established by House Bill 65, the Joint Study Commission on Low THC Medical Oil Access will examine in-state access to medical cannabis and low THC oil, including the security and control of the process from acquisition and planting of seeds to final destruction of unused portions of the plant; quality control of the manufacturing process; and dispensing the final product. The commission will also explore and identify ways to ensure proper security safeguards and systems for evaluating the qualifications of potential licensees, as well as implement a plan to ensure that low THC oil is affordable and readily available statewide to properly registered patients and caregivers. Commission meetings are open to the public and meetings will also be streamed online. 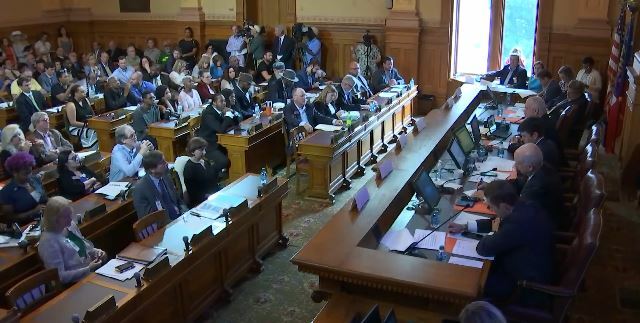 To access the live stream, visit http://www.house.ga.gov/mediaServices/en-US/VideoBroadcasts.aspx.